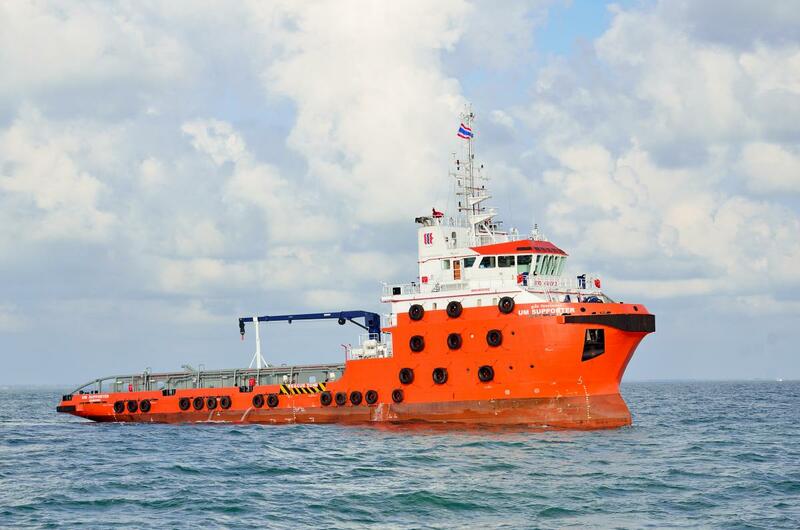 UM Supporter PSV : MEO’s Thai joint venture, Uniwise Offshore, has taken delivery of the “UM Supporter”, a 2000DWT PSV from POET Shipbuilding & Engineering, in December 2012. The vessel immediately entered into a 3 year firm contract, plus 2 x 1 year extension options, to provide coil tubing support services to a major O&G company’s activities in Gulf of Thailand. This new contract is a continuation of a long standing relationship with them in the region. The fully SPS 2008 compliant vessel has total accommodation for 50 persons and 500m2 of clear deck area space. Combined with a service speed of 12 knots with twin 2610bhp main engines, it is also fitted with 2 x 9 tonne bow thrusters and telescopic boom crane. Good capacity for dry bulk & bulk liquids (muds, brine, drill water, fuel, etc) with a dedicated integral tank of 150m3 for cement is also available.